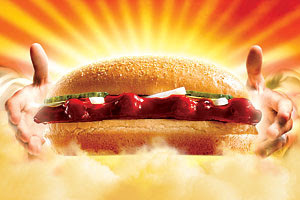 The McRib is taking the nation. My husband MADE me buy one for him today. He said "But it's the McRib! It's only for a limited time and they mean it!" It was nice to stuble across your blog today - rock on guys. Nice to read your comment too. I think this blog is the best - but then I'm the mom!